The love triangle is a story device that is often incorporated into comedies, in various iterations, one of which is when two siblings wind up dating the same person. More often than not, the siblings aren’t aware of this and neither is the person dating them, but the audience is in on it and as the movie progresses, these characters slowly (awkwardly and humorously, usually) become aware of the truth. Making her directorial debut with “My Blind Brother”, screenwriter Sophie Goodhart, takes this concept and adds plenty of relatable insecurities and sensitivities to it, in a story that revolves around three flawed people who are more or less like you and me – at least moreso than we’d like to admit. There’s a smart script here grounded by three great actors who are able to juggle the film’s tone of subversively dark humor with laugh-out loud moments. The story is predominately told from the perspective of Bill (Nick Kroll), a middle-aged manager at a Ohio copy service store, who would rather sit on his couch and watch TV when he’s not at work. He rarely can though, because he’s obligated to be there for his blind brother, Robbie (Adam Scott), who consistently partakes in one charity sporting event after another, to raise awareness for those with disabilities and in turn becoming something of a known celebrity in his town. He’s encouraged by his parents and a throng of loyal supporters from a foundation called Out of Sight, some of whom also have disabilities of their own. Robbie is assisted by the exasperated Bill, who is tethered to Robbie as a sort of human guide-dog during these challenges. In what seems like a typical after effect, Robbie gets all the attention and praise after a marathon while the out-of-shape Bill gets completely ignored – even by Robbie. The sightless over achiever wastes no time and soon commits to swimming across a lake, which will require specific training and Robbie naturally assumes Bill will assist him. Feeling maligned and frustrated with his place in life, Bill isn’t sold on the idea and in an effort to take a break, he heads to a bar one night where he meets Rose (Jenny Slate), a young woman who’s feels responsible for the recent accidental death of her boyfriend. These two hit if off, bonding over self-loathing and misery, which in turn results in a fun and rare one-night stand back for Bill, back at the apartment he shares with Robbie. The next morning however, the conflicted Rose slips away with a thanks-but-no-phone-number, leaving the dejected Bill to resort to in his pathetic emotional state. That’s not the end of Rose though. Soon enough, she pops up as Robbie’s new assistant after Bill drops out of helping his brother swim across the lake. Her goal is to be of service to others, in order to purge the guilt she feels and ultimately feel better about herself, which is how she found Robbie, but unintentionally backs herself into a relationship with her new employer. She is stunned to learn that Bill is Robbie’s brother and both Rose and Bill experience different waves of awkwardness as they venture into varying degrees of awkwardness. As confusing and difficult as the situation is, Bill decides to pursue Rose, knowing that they are more suitable for each other than she is with Robbie, leaving his blind brother oblivious until the inevitable truth surfaces. The most noticeable aspect of “My Blind Brother” is the sibling dynamic. Robbie is arrogant, shallow and self-absorbed and Bill is admittedly lazy, complacent and self-loathing. Such a relationship dichotomy lends itself to some comedic and complex situations since it feels both funny and real. Goodhart is essentially using the character’s own neuroses and guilt to allow opportunities for some lighthearted laughs and some raw observations. Bill is in a conundrum, since he feels compelled to help his brother, but is tired of being overlooked and unappreciated by Robbie and everyone else around them. Robbie, who continuously takes him Bill for granted, often berating him in public, is not just literally blind, but also figuratively blind to the needs and emotions of Bill or anyone else for that matter. Robbie never once thanks his brother during the congratulatory speeches that follow every “Congratulations Robbie!” event, which serves to build Bill’s growing resentment toward him. It’s not until he meets Rose that Bill finally has someone he can talk to and commiserate with. He’s can tell her how he secretly wishes he had a disability of his own, so he could just sit around and watch TV and soak up the kind of attention Robbie gets. 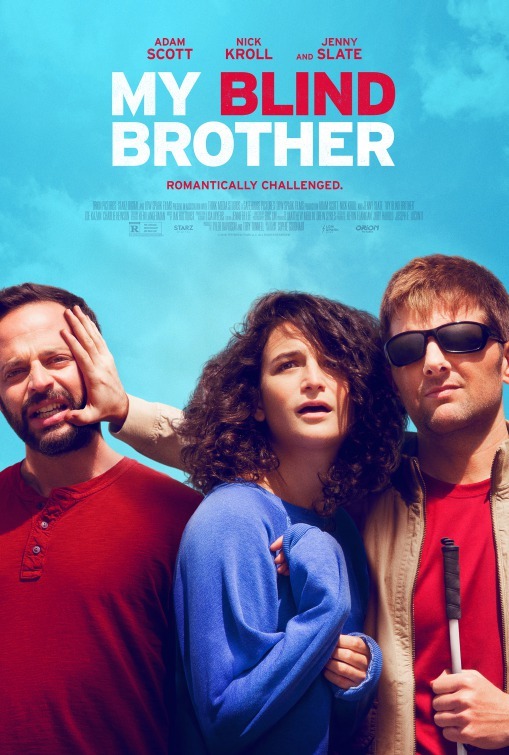 “My Blind Brother” could’ve been flat-out goofy, like a 90s Farrelly Brothers movie, but she’s aware of the truth behind these three characters and finds a way to communicate that effectively in her intuitive characterization, while keeping certain situations as awkward and funny as they should be. One specific scene stands out, when Robbie steps out for a walk, giving Bill and Rose the opportunity to give into their carnal desires only to be interrupted by Robbie’s abruptly early return. 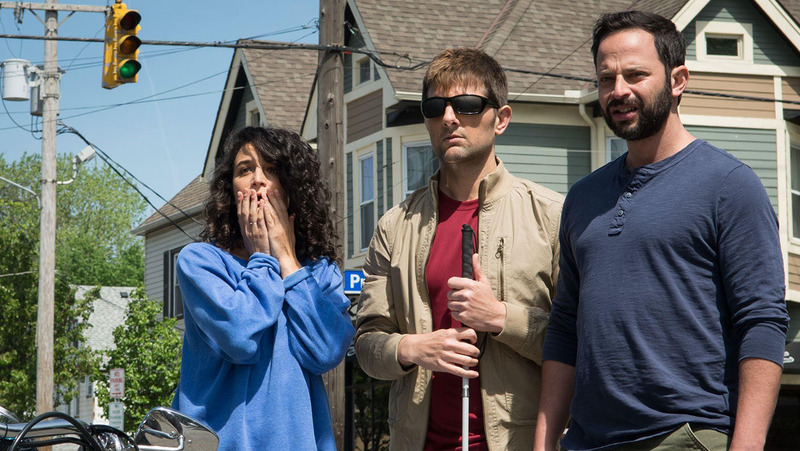 All three actors are sublime in their responses to the situation, particularly Scott, who has to remain the blind character while Kroll and Slate contort into hilarious positions as they put their clothes back on. It’s a truly funny scene that also expresses the frustrations of hiding in plain sight, even around a blind man. If it wasn’t for Rose entering the lives of these siblings, they would probably continue to be frustrated and clueless. Her addition may add complications, but since she too is emotionally damaged goods, there is common ground to be found. Because she is uncertain and hesitant to acknowledge her own emotional needs, she believes putting the needs of others before her own will offer her a kind of atonement or good karma possibly. That’s how she falls into a dating relationship with the cocky Robbie, instead of Bill, who is equally pained about his live situation. It’s this kind of relatable characterization that Goodhart nails, understanding how flawed and prone to emotions that drive us instead of logic and common sense. Goodhart could’ve mined her film with cruel jokes at the expense of “the blind guy”, but I think she manages to respectfully write Scott’s Robbie as a guy who’s masking his fears by being an arrogant douche. Scott’s work here is impressive since he manages to make Robbie unlikable yet undeniable bold and funny. He’s awful to Bill, but in return the eye-rolling Bill is no angel, often toying with the idea of harming his brother, like leaving an eye level kitchen cabinet door open while Robbie fixes himself something to eat. It’s the kind of cruelty that all siblings try to (or at least fantasize about) commit, but often wind up considering the cause and effect of such action. Since “My Blind Brother” revolves around three messed-up characters, Goodhart adds another character in Francine (Zoe Kazan), Rose’s roommate, serving as an outsider who offers some sarcastic logic and common sense to the situation. Kazan brings the same irresistible charm that she brought to “Ruby Sparks” and “What If” and gets some hilarious expressions in as well as some memorable line delivery. She comfortably fits right in with this bizarre love triangle. What’s most impressive about “My Blind Brother” is how Goodhart manages to the titular character to be an intolerable man with a giant ego, where any other film might tip-toes around this in an effort not to come across as ridiculing the disables. You can be blind and be a jerk. It’s nice to find an indie comedy that doesn’t rely on recognizable formula and instead emphasizes poignant emotional layers that rise above typical clichés.